US President Trump and Moon Jae-In met amid tensions over North Korea. United Nations: US President Donald Trump on Thursday said he will announce new sanctions against North Korea as South Korea warned the United Nations of the risk of accidentally igniting a war. After threatening to "totally destroy North Korea" in his first address to the General Assembly, Trump was to sit down with Japanese Prime Minister Shinzo Abe and South Korean leader Moon Jae-In to discuss the way forward. "We will put more sanctions on North Korea," Trump said during a meeting on the margins of the assembly, after aides previewed an announcement later Thursday. 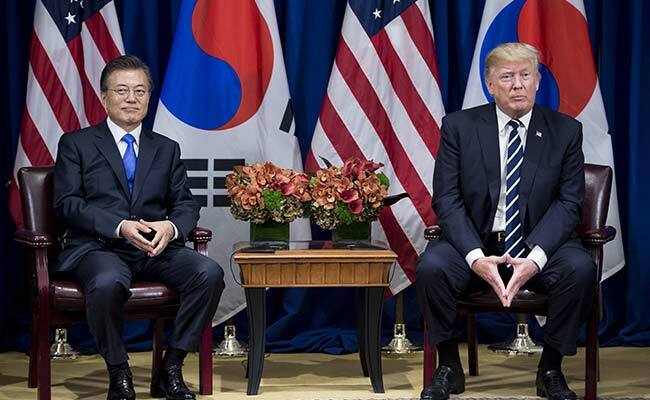 After Trump's fiery speech, Moon struck a different tone, saying the crisis "needs to be managed stably so that tensions will not become overly intensified or accidental military clashes will not destroy peace." Moon said South Korea was not seeking the collapse of its neighbor and was ready to help if Pyongyang decides "to stand on the right side of history" and halts its provocations. Moon nonetheless voiced support for sanctions, calling for all nations to implement the latest UN Security Council resolution that bans North Korea's textile exports and end contracts for guest workers. The United States has separately imposed unilateral sanctions, some of which target firms from China which is the primary economic partner of North Korea. At a Security Council meeting later Thursday, US Secretary of State Rex Tillerson was to push for strict enforcement of a new raft of sanctions targeting North Korea's exports and its energy supplies. The council last week adopted the latest sanctions, a significant ratcheting-up of the punitive measures aimed at cutting off revenue used by Pyongyang to develop its military programs. But their impact hinges mostly on China. China's Foreign Minister Wang Yi and his Russian counterpart Sergei Lavrov, who will also deliver their speeches on Thursday, have called for diplomatic talks and warned that military action would be catastrophic. In his UN address on Wednesday, Japan's Abe backed the tough US stance, declaring that the time for dialogue with North Korea was over and that pressure must be brought to bear. Washington and its allies hope the tough economic sanctions will sway Pyongyang to come to the table and negotiate an end to its nuclear and missile programs. The US administration has refused to offer North Korea incentives to open negotiations and has ramped up threats of military action to force leader Kim Jong-Un -- whom Trump has dubbed "Rocket Man" -- to change course. Commenting on Trump's fiery speech, French President Emmanuel Macron surmised that the "military threats can serve a purpose from a tactical point of view" to jolt Pyongyang into changing course. "When you consider him and his father, it was only when such threats were made that negotiations did happen," Macron told reporters. But German Chancellor Angela Merkel was in "clear disagreement" with Trump, saying in a radio interview that "any kind of military solution is completely deficient." Opening this year's gathering, UN Secretary-General Antonio Guterres warned that "fiery talk can lead to fatal misunderstandings" that could ignite a nuclear war, and called for a political solution. Guterres is due to meet on Saturday with North Korean Foreign Minister Ri Yong-Ho on the sidelines of the assembly to send out feelers on possible diplomatic talks. Ri, who takes the podium on Friday, dismissed Trump's threats to destroy his country as "a dog's bark" and said they would have zero impact.